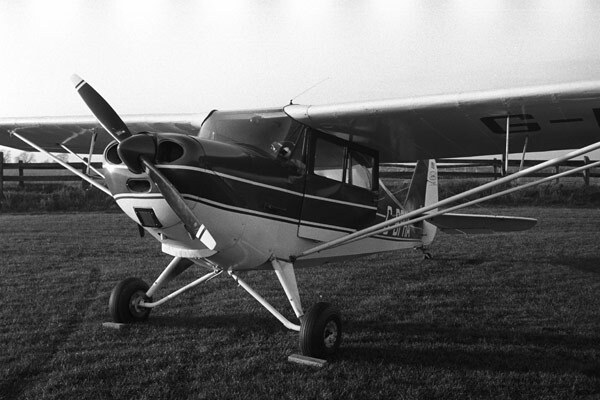 This is a 1946 Aeronca Chief, a classic US post-war design of strut-braced high wing, tube fuselage and wooden spars with pressed aluminium ribs. I bought her in 1989, when I was flush with cash after a busy patch. I had less than seventy hours at the time, all on spam-cans so she was quite a learning curve, but one that has stood me well; almost all of my flying since then has been with taildraggers off grass strips. No electrics to speak of, so it was a hand-start, as many of my planes have been since then. Hand-swinging isn't the big deal it sounds, and my current planes are both hand-swingers. Saves maintenance and complexity, and as long as you stick to the same regime for safety, nothing to worry about. Instils respect, perhaps, and rather satisfying in a 'Golden Era' kind of way. My Aeronca still had all her original instruments, including an altimeter calibrated in inches of mercury. I thought it was a pain in the bum at the time, but I've gone high and low looking for just this instrument to rebuild the Rearwin's panel twenty years later. I sold the Aeronca eighteen months later when work was less than abundant, which was a great shame. If I could have afforded to keep her, I'd probably still be flying her today. And she is still flying today, only with wheel-fairings.